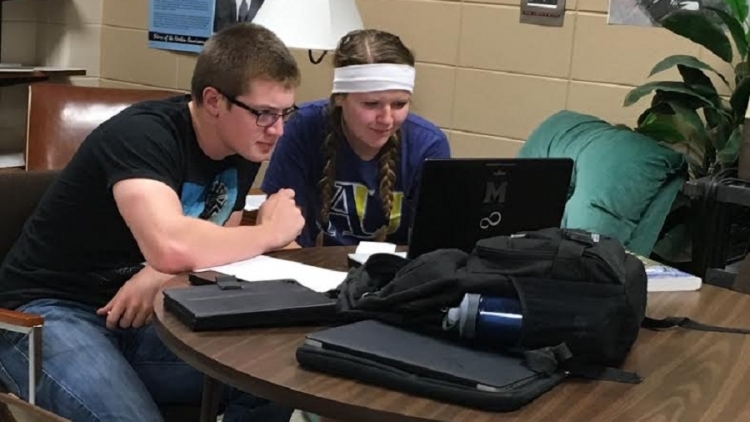 tutor services to any enrolled Augustana student. English conversation table on Thursdays 4-5 p.m. during Fall and Spring. Cappuccinos, tea, and bread provided. Sunday 7:00 - 10:00 p.m.
Monday 7:00 - 10:00 p.m.
Wednesday 7:00 - 10:00 p.m.
Help with any writing assignments (not just English). Discuss writing assignments to help you understand what is required. Assist you to think through and develop your ideas. Help you organize your information and plan your paper. Suggest strategies to help you edit and proofread effectively. Walk-ins welcome. Or, to guarantee a spot, use our new appointment-booking system at augie.mywconline.com. Connect with us via Twitter and Facebook. Call to set up a weekly appointment time or stop in during the walk-in hours for help with any writing assignment. Happy Spring! Please stop by our English Conversation Table on Thursdays 4-5pm for coffee, bread, and conversation. Sarah: Biology and Spanish majors; good with scientific reports, APA formatting, and English essays. Hours: Mondays 8-10; Thursdays 6-8pm. Najma: Philosophy and Communications majors; all-around wonderful person. Hours: Sundays 8-10; Mondays 7-9pm. Baylee: Elementary Education major, minor in ENL; good with APA, MLA, and FYS writing. Hours: Sundays and Thursdays 7-9pm. Kendra: English Major; good with MLA, FYS writing, and academic writing. Hours: Wednesdays 7-9; Thursdays 3:30-5pm. Lauren S: English and Religion/Philosophy majors; comfortable with Chicago and MLA style. Experienced in Civitas, academic, and creative writing. Hours: Sundays 8-10; Mondays 8-10pm (library). Kaatje: Journalism major with a minor in German; comfortable with APA, MLA. FYS writing and journalistic writing. Hours: Tuesdays and Thursdays 8-10pm. Destiny: English and Government majors; good with basic French and Journalism. Hours: Sundays 7-9; Thursdays 7-9. Jessica: English and journalism majors; comfortable with MLA, Chicago, and APA. Experienced in journalistic, academic, and creative writing. Hours: Tuesdays 7-9; Thursdays 3:30-5pm. Anna: Business Administration, Economics, Government, and Spanish majors; Pre-law; Biology 110 TA; Civitas; loves sharks. Hours: Tuesdays 3:30-5; Wednesdays 8-10. Andrew: English and Psychology majors; comfortable with MLA and APA styles; native Spanish speaker (loves tutoring in Spanish, too!). Hours: Mondays 8-10; Thursdays 8-10pm (library). Olivia: English major, Biology minor (Civitas); good with biology and chemistry lab reports and most other types of writing, especially English papers. Hours: Tuesdays 7-9; Thursdays 8-10pm. Rebekah: Journalism and STEM majors; comfortable with MLA, APA, and journalistic writing. Also good with formatting chemistry lab reports and Civitas papers. If you have cookies, please bring some to share. The sugar variety is preferred. Hours: Sundays 8-10 (library); Wednesdays 7-9pm. Ryan: Government major with History and Economics minors; good with MLA, Chicago, and APSA. Love Brainstorming and learning about new things. Experienced with writing and reviewing Civitas papers. Hours: Tuesdays 3:30-5 and 8-10pm. Jacob: English, Journalism, and government majors; comfortable with MLA, journalistic writing, and Chicago Style. Hours: Sundays 8-10; Tuesdays 8-10pm (library). Lauren K: Biology major with minors in English and History; comfortable with Civitas, FYS writing, and lab papers. Hours: Wednesdays 8-10 (library); Thursdays 8-10pm. Jack: English and Government majors, American studies minor; good with Chicago, MLA, and creative writing. Hours: Mondays 7-9; Wednesdays 8-10pm.